When your father’s resume includes building Kathmandu’s famous temples, you have your work cut out if you intend to follow in his footsteps. Despite that, Ratna Sundar Silpakar made the brave decision to emulate his famous dad, Mangal Bahadur Silpakar, but changing times have complicated that choice. 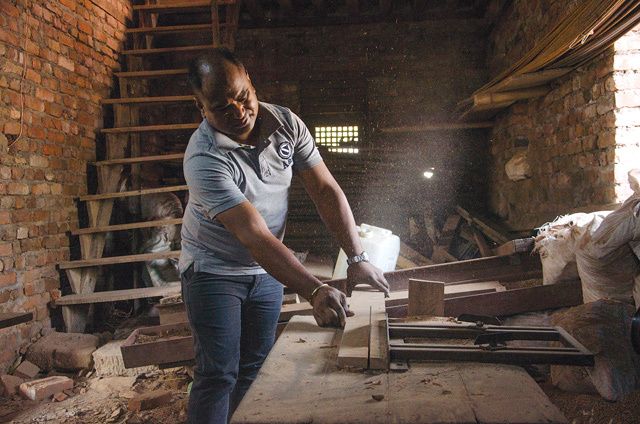 Both father and son uphold the tradition of wood carving, but are pragmatic when it comes to adapting to modern construction techniques, especially after the earthquake destroyed many of Kathmandu Valley’s monuments. Mangal Silpakar has in the past worked on the Aakash Bhairab shrine, the Mahaboudha temple, Dyo Chhen at Tebahal, the Naksal Bhagawati, Dhumbarahi Mahadev Mandir and the reconstruction of Hanuman Dhoka museum. 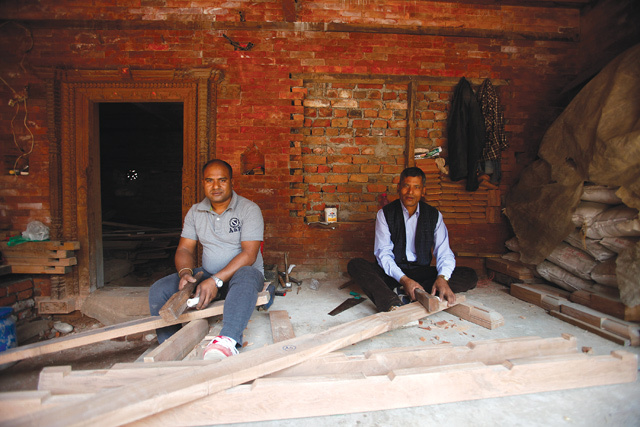 Today, both father and son acknowledge the challenge of finding the right raw materials in post-earthquake rebuilding. Reconstruction is not an exact science, and they try to get the original design of fallen monuments from the municipality, but these are usually not accurate. “In the case of temples that got damaged during the earthquake and don’t have any measurements, we look at the available photographs and estimate the dimensions,” explains Mangal, who has in the past used steel beams for the wooden dalin while working on the Dyo Chhen at Mahaboudha because a 13-foot timber span was unavailable. Even the traditional bajra mortar has been modified for strength. The original 1:1 ratio of surki and chun has been replaced with one part cement since the limestone is not of the required quality. The father notes that the time taken to make a temple is directly proportional to the availability of raw materials. 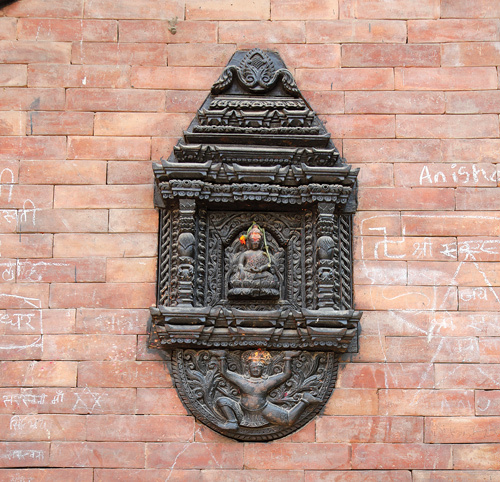 Ratna Silpakar graduated from Bhaktapur Multiple College but dabbled in wood carving only as a hobby as he tried a few salaried jobs. He eventually came back to what he felt was his true calling: learning the art of wood carving under the patient and diligent tutelage of his father, whose own knowledge was passed down from generation to generation. In his early days, Ratna began with simple designs and small souvenir items for tourists. Eventually, like his father, he was confident enough to attempt reconstructing temples. We ask Mangal what difference he sees in the profession of wood carving today: “There is much more use of machines now to cut wood, but the final product is inferior to hand-carved items.” He takes his father’s advice and uses chisels and tools that haven’t changed in nine centuries. But the real challenge is to find the right type and quality of wood. Ratna is an exception in Kathmandu: most from his generation have not followed their ancestral professions, preferring to migrate for work or study abroad. He says he has found his life’s passion, and believes there is enough work to make a decent living. The people need democracy, but the king needs it even more. 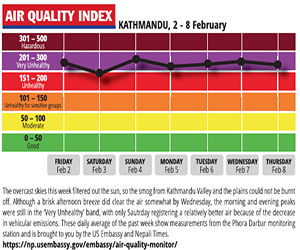 Lak takes a leap to predict things a century hence.